While many individuals think that history degree holders are only qualified to work as teachers, in recent years the number of career paths has expanded significantly. Whether you want to work for a museum, university, nonprofit, or for yourself as a historical consultant, many opportunities exist for meaningful work. Historians with a master’s degree brought home median salaries of nearly $60,000 in 2017, according to the Bureau of Labor Statistics. Those in the top tenth percentile commanded salaries of more than $107,000. What Else Can I Expect From an Online Master’s in History Program? Harvard University’s Extension school has its roots in the Lowell Institute, which was founded in 1835. Harvard University’s Extension School provides an Ivy League education to working professionals, students in remote areas and other distance learners. The Extension School’s online history master’s degree requires students to complete 12 courses, including a capstone research paper or a thesis. Most students graduate within two years of full-time study. The program uses a blended learning approach; students must complete three on-campus courses in addition to their online coursework. During the program, students can also pursue an optional certificate in American literature and culture. In order to earn admission, students must first complete three online or in-person courses through the school. If they earn satisfactory grades, they can apply for full admission. As a private university, Harvard charges each student the same tuition regardless of location. Harvard is regionally accredited by the New England Association of Schools and Colleges (NEASC). Based in the southeastern North Carolina port city of Wilmington, the University of North Carolina Wilmington (UNCW) offers several degree options. These options include a master’s degree in history online. This 30 credit program is designed for mid-career and aspiring high school teachers, museum educators, librarians and archivists who want to deepen their knowledge of history. Students take two courses in each of the following subjects: U.S. history, European history, Global history and thematically-based subjects. The curriculum consists of two three-credit courses per semester, and students can graduate in 24 months. Each course lasts seven weeks. The program also includes two mandatory, on-campus institutes which students complete over two summers. The first institute investigates how public historians examine local and regional history. The second institute provides a capstone experience. Students complete the program’s remaining 24 credits through asynchronous online coursework. The program does not have a thesis requirement. UNCW is regionally accredited by the Southern Association of Colleges and Schools Commission on Colleges (SACSCOC). Based in Memphis, the U of M offers comprehensive services to students pursuing the school’s online master’s degree in history. These services include advising, professional development workshops, and career counseling. The 33-credit program allows students to specialize in areas like Southern and African-American history, women’s and gender history, and the renaissance. The curriculum also allows students to earn credit for an internship in the field. Transfer students may bring up to 15 credits with them. The online version of the MA program does not include a thesis option, though students must pass a comprehensive exam in order to graduate. The program delivers all online coursework asynchronously, although students in the online program may opt to take certain courses on campus. Located about an hour outside of Houston in the city of Huntsville, SHSU offers over 20 online programs, including an online master’s degree in history. The program’s curriculum requires between 30 and 36 credits and allows students to choose between a thesis and a written portfolio as a capstone experience. The program opts for a generalist approach in its coursework, allowing graduates to teach, enter the military or civil service, or pursue further education. Students can complete the program through asynchronous coursework, with no on-campus requirements. Students can also opt for a blended learning approach that includes some on-campus residencies. Prospective students may apply for admission in the fall, spring, and summer terms. Based in Tempe, ASU boasts one of the largest enrollments in the nation. The university also maintains an extensive distance learning presence, including an online history master’s degree. The program requires students to complete 10 courses, each of which lasts seven and a half weeks. Program coursework includes studies in genealogy, oral history, and the Civil War. ASU delivers all online coursework asynchronously, and students never need to visit campus to earn their degrees. Prospective students need at least 18 undergraduate credits of history or social science coursework. The school also requires a minimum undergraduate GPA of 3.3 from prospective students. Students may apply for fall, spring, and summer admission. Graduates of the program can work in education, for nonprofit organizations, or for national parks, among other settings. Based in Lynchburg, Virginia, Liberty University expanded over the past couple of decades in large part thanks to distance education. The school enrolls over 100,000 students worldwide, only 15,000 of whom attend on-campus classes. As such, the school enrolls 85,000 online students, including 30,000 military students. Liberty’s extensive slate of distance learning programs includes a master’s degree in history online. The history program requires students to complete 36 credits, a process that takes, on average, 18 months. Transfer students may bring half of these 36 required credits with them. The program’s curriculum includes plenty of flexibility, requiring only two courses and allowing students to choose the remaining 30 credits from electives. Liberty delivers all online coursework asynchronously. Located in the city of Kearney, the University of Nebraska at Kearney caters to students far beyond the borders of the Cornhusker State through its distance learning platform. The eCampus includes an online master’s degree in history that offers thesis and non-thesis options. Students who want to pursue a Ph.D. should consider the thesis track, while those who hope to teach at middle schools, high schools, or community colleges will find more value in the non-thesis track. Students may also pursue a public history track. All of the program’s concentrations require students to complete 36 credits, including two required courses: America interpreted and historical methods. UNK delivers online coursework asynchronously and requires GRE scores and a minimum undergraduate GPA of 3.25 from prospective students. UNK is regionally accredited by the Higher Learning Commission (HLC). A state-operated university focusing specifically on master’s and doctoral programs, Slippery Rock University occupies over 600 acres in western Pennsylvania. The college also offers several distance learning programs, and students never need to visit campus to earn their online master’s degree in history at SRU. The program’s 30-credit curriculum delivers all coursework asynchronously and aims for flexibility so that working professionals can fit graduate study into their busy schedules. Full-time students can complete the curriculum in two years of full-time study. Students must take a pass/fail comprehensive exam after completing 21 credits. The school requires an undergraduate GPA of at least a 3.0 from applicants. Graduates of the program can enter government, law, or teaching professions or opt for further graduate study at the Ph.D. level. SRU is regionally accredited by the Middle States Commission on Higher Education (MSCHE). Based in the cities of Manchester and Hooksett, SNHU changed its primary focus to distance education in recent years. Of the school’s 90,000 undergraduate and graduate students, 93% enroll online, and 83% of those students live out of state. As such, the school offers an extensive slate of distance learning offerings, including an online history master’s degree. The online history program requires students to complete 33 credits. The curriculum adopts a survey approach and includes studies in historiography, historical methods, and comparative history and research. All students in the program must complete a capstone historical research project. SNHU delivers all online coursework asynchronously and charges students the same per-credit tuition no matter where they live. Located in Hays, Kansas, FHSU differentiates itself from other Kansas state schools by focusing primarily on distance education. Of the school’s approximately 15,000 students, nearly 6,900 enroll in FHSU’s Virtual College. Students can pursue a non-thesis master’s degree in history online at FHSU. The program requires students to complete between 30 and 33 credits. Within that 30–33 credit curriculum, students must complete two major research papers and courses in historical methods and historiography. Students must also pass a comprehensive exam. Students may choose elective courses to fulfill requirements for 21 of the required credits. FHSU delivers all program coursework asynchronously and never requires online students to visit campus for any reason. Students who wish to complete a thesis through the program must enroll in the on-campus version. FHSU is regionally accredited by the Higher Learning Commission (HLC). Based in Bowling Green, Western Kentucky University has expanded its online presence in the last two decades. That expansion lead to a wider selection of distance learning programs, including an online history master’s degree. The history program focuses primarily on future teachers and professors, preparing graduates for high school classrooms, community colleges, and further graduate study. The online degree does not require a thesis and offers a rotating set of courses each year. This rotation allows students to graduate in three years of part-time study. The curriculum consists of 36 credits and allows students to specialize in world, modern European, pre-Civil War U.S., or post-Civil War U.S. history. The program delivers coursework in all concentrations asynchronously. The program’s only required course is historiography. WKU is regionally accredited by the Southern Association of Colleges and Schools Commission on Colleges (SACSCOC). Operating 14 campuses throughout the world — including five schools in Texas and one in Kenya — WBU distance education philosophy fits it global mission. The school’s group of online programs includes an online history master’s degree. The program requires all students to complete 37 credits to graduate, and students may pursue thesis or non-thesis tracks. The program includes two required core courses in historiography and historical methods, but students may choose the rest of their courses from among electives. Possible courses include the Vietnam War, public history, regional history, U.S. foreign relations, and the world wars. The program delivers all coursework asynchronously, and WBU never requires online students to visit any of the school’s campuses. WBU is regionally accredited by the Southern Association of Colleges and Schools Commission on Colleges (SACSCOC). Union Institute and University historically focused on alternative educational methods, favoring social impact and interdisciplinarity in its early years. Today, the Cincinnati-based school focuses on distance education and blended learning. The university offers a master’s degree in history online that requires students to complete 36 credits. Full-time students typically finish their degrees in four semesters, while part-time students typically finish in six. The program includes more extensive core requirements than similar offerings, including two courses in disciplinary foundations: one in the elements of scholarship and one in research methods. Once they finish the core, students must complete advanced history courses in addition to a thesis. UI&U delivers all online coursework asynchronously and does not require students to visit campus for any reason. Union is regionally accredited by the Higher Learning Commission (HLC). Based in Springfield, Missouri State enrolls the second-most students among all the colleges in the Show Me State. The university offers several of its strongest programs through distance learning, including the online history master’s degree. The program requires 30 credits, and a typical part-time degree path requires students to take two courses per term for two years. Missouri State now offers historiography — the foundational course for the degree — every term. Missouri State aims to give working professional students maximum flexibility by delivering all online coursework asynchronously and never requring online students to visit campus. All courses are taught by full time tenured or tenure-track faculty. Students can choose one of three program tracks: American Studies, US and World Studies, or Global Studies. Online students can now choose a thesis or non-thesis program path. The program also offers unique courses, such as a course on plagues and pandemics and a women’s history seminar. Missouri State is regionally accredited by the Higher Learning Commission (HLC). Based in the city of Charleston, EIU originally opened as a teacher’s college. It now offers programs across the liberal arts and business, including distance learning programs like its online history master’s degree. The degree differentiates itself from other graduate history programs by catering specifically to students who want to become K-12 history teachers. To that end, the curriculum covers essential content areas such as U.S. or world history and specific areas such as the Cold War or Meiji Japan. Part-time students can finish their degree in three years by taking one course during each fall and spring semester and two courses each summer semester. However, the program allows students to take longer if necessary. The program delivers coursework asynchronously and requires students to spend a five-day residency on campus at the beginning of their first semester. EIU is regionally accredited by the Higher Learning Commission (HLC). Based in the Dallas-Fort Worth area, SAGU offers degrees across a variety of disciplines, including Bible and church ministry. The college also offers distance learning programs, including an online MA in history. Unlike some peer programs, SAGU’s online history degree allows students to choose between thesis and non-thesis tracks. The program prepares graduates for diverse careers, including librarians, archaeologists, teachers, information officers, and museum curators. SAGU aims for affordability and flexibility in education. As of August 2018, the school offered a grant for 15% of tuition, renewable each semester, to everyone enrolled in the online history master’s degree. In addition, the program delivers coursework asynchronously, allowing working professionals to complete coursework at their convenience. SAGU is regionally accredited by the Southern Association of Colleges and Schools Commission on Colleges (SACSCOC). Located in Pittsburg, Kansas, Pitt State caters to local students in the southeast corner of the Sunflower State. The school offers more than 50 online programs, including an online history master’s degree. The history program focuses on preparing future history teachers, a goal reflected in the program’s mission statement. The program also caters to individuals who want to continue their studies at the Ph.D. level or enter law, politics, or government. The program delivers all coursework asynchronously and never requires students to visit campus. Pitt State’s graduate school accepts students in the fall, summer, and spring terms and does not list specific minimum GPA or GRE requirements. Pitt State is regionally accredited by the Higher Learning Commission (HLC). Based in Monroe, the ULM is part of the University of Louisiana System. The university recovered from financial difficulties in the early 2000s and now offers strong programs in business, English, and marriage and family therapy. The college also maintains a significant distance learning presence, including an online history master’s degree. The 30-credit history program offers courses in Native American history; Voodoo, Hoodoo, and Conjure; and Louisiana in the Civil War and Reconstruction. ULM delivers all online coursework asynchronously and does not require students to visit campus. The program does, however, require either a minimum 3.5 undergraduate GPA or a minimum 2.5 undergraduate GPA combined with a minimum combined GRE score of 283. ULM is regionally accredited by the Southern Association of Colleges and Schools Commission on Colleges (SACSCOC). Located in Northfield, Vermont, Norwich University is the oldest of the nation’s military colleges. The college also holds the distinction of the birthplace of Reserve Officers' Training Corps. The school offers several distance learning programs, including an online history master’s degree. In the history program, students choose a concentration in either world history or American history. The program’s curriculum includes six classes, each of which lasts 11 weeks. Most students complete the degree in 18 months. The program aims for personalized and individualized learning, as the average class includes 15 students. The program delivers coursework asynchronously, and all students must complete a one-week residency on campus in Vermont. Norwich is regionally accredited by the New England Association of Schools and Colleges (NEASC). Based in the city of Ruston, Louisiana Tech historically focused on industrial and technical fields. It now offers distance learning programs in business, the liberal arts, and other non-technical areas. This slate of offerings includes an online history master’s degree, which requires students to earn either 30 (thesis track) or 33 (non-thesis track) credits. The program maintains cooperative agreements with the University of Louisiana at Monroe and Louisiana State University, allowing students to earn credit by taking courses at those schools. The program delivers coursework asynchronously, and students must choose a major or 12 credits of related courses within a single historical field. The program requires GRE scores and at least 21 credits of undergraduate history courses from prospective students. Program graduates can teach history in secondary schools or work as librarians, archaeologists, or other history-related professions. Louisiana Tech is regionally accredited by the Southern Association of Colleges and Schools Commission on Colleges (SACSCOC). Located in Ashland, Ohio, Ashland University offers several distance learning programs in American history and government, including an online history master’s degree. The program offers both an online option and a blended-learning option that includes week-long residencies on campus during the summers. Each delivery method uses video conferencing to deliver synchronous, online courses. The program strives to provide an affordable graduate education for all students. To that end, students may take their first course on-campus during a summer semester for free. Additionally, the program typically awards fellowships of $500 to $750 to students who travel to campus for week-long residencies. Online students also benefit from dedicated academic advising throughout their time at Ashland. Ashland University is regionally accredited by the Higher Learning Commission (HLC). Based Emporia, Kansas, Emporia State University counts itself among the oldest universities in the Sunflower State. The school offers distance learning programs in business, arts and sciences, library science, and education. That slate of offerings includes an online history master’s degree, which includes a thesis track, a non-thesis track, or a social sciences education track for K-12 teachers. The thesis track caters to future Ph.D. students, and the non-thesis track caters to students who want to enter archaeology, libraries, government, or other history-related fields. Students in the program who want to work in libraries or archives may pursue a dual program that also awards a certificate in archival studies. The program delivers courses both synchronously and asynchronously, occasionally requiring students to attend live online courses one night a week. Emporia State University is regionally accredited by the Higher Learning Commission (HLC). The University of Massachusetts (UMB) primarily caters to local students from Massachusetts. However, the college has grown both physically and online in the past two decades, fulfilling a 25-year “master plan” that includes expansion into the distance-education space. As a result, the university now offers an online history master’s degree. The program serves current K-12 teachers looking to expand their content knowledge or students who want to pursue a Ph.D. in history. Most of the program’s courses require between 250 and 300 pages of reading per week and 25 pages of writing per semester. The online history program limits admission to 15 to 20 students per cohort. As such, UMB’s history program requires more competitive applicants than some peer offerings. The school requires a minimum undergraduate GPA of 3.0 — including a minimum GPA of 3.33 in history courses — from prospective students. Although applicants do not need to submit GRE scores, the school strongly recommends including them. UMB is regionally accredited by the New England Association of Schools and Colleges (NEASC). The oldest four-year public college in Alabama, The University of North Alabama (UNA) served as the state’s first teacher’s college and one of the nation’s first coeducational schools. The Florence-based school now offers several of its programs through distance education, including an online history master’s degree. The program allows full-time students to earn their degrees within two to three years. Aiming for flexibility, the program also delivers all coursework asynchronously. The program mainly caters to future history teachers and students interested in politics, nonprofit organizations, and journalism. The program’s curriculum consists of 33 credits and delivers coursework through seminars on U.S. and world history. All students must pass a comprehensive examination in order to graduate. Students may choose between thesis and non-thesis tracks. UNA is regionally accredited by the Southern Association of Colleges and Schools Commission on Colleges (SACSCOC). With so many online history master’s degrees available, students may wonder how to narrow their choices down to just a few options. While the list of programs may feel overwhelming at first, many learners find it easier to use a process of elimination to create a smaller pool of potential programs. One of the most important things to consider is the focus of the department. Since history encompasses so many eras and subjects, each school offers different courses and research interests. For example, degree-seekers interested in American studies should seek out faculty members well-versed in this subject. Students should also review available concentrations, since this can provide a better sense of the strengths of the department. Learners can also research electives and core curricula. In addition to core and specialized coursework, most online history master’s degrees require a culminating thesis. These documents usually range from 20,000 to 40,000 words. Learners examine a time or topic in history using primary research and independent thought. 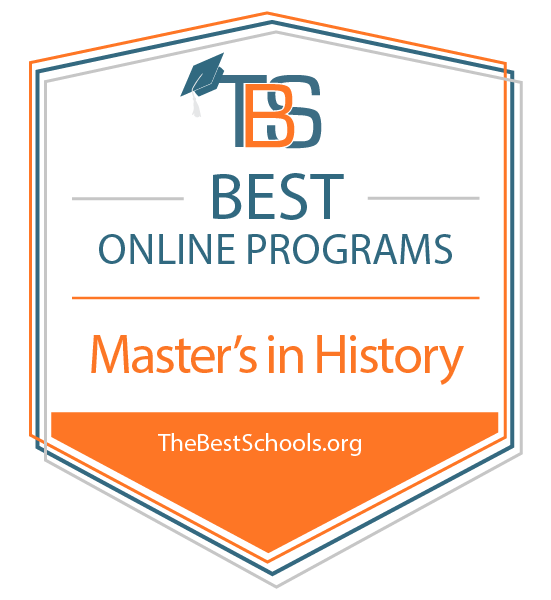 Many online history master’s degrees offer similar introductory classes during the first semester. However, each school focuses on different events, historical eras, and geographical areas. After reviewing the common courses and concentrations highlighted below, students should research the curricula for any programs they consider attending. This concentration focuses on history from 1750 to the present. Major events include the Industrial Revolution, world wars, the Russian Revolution, decolonization, and the Cold War. Coursework may focus on any part of the world. This concentration examines the history of the European continent. Students examine the shifting borders of nations and empires across centuries. Topics include wars, major illnesses, cultural and social shifts, and modernization. Learners also discuss colonialism and foundations of modern governments. This concentration focuses on the role of women throughout history, with special emphasis on power shifts and dynamics. Students discuss how individuals and cultures have viewed women’s place in society over time. Classes also analyze women’s significance in major historical events. Taken during the first year, this course examines trends within historical research, helping students understand how historical theories and frameworks connect to professional practice as a historian. This course assesses how the idea and practice of medicine developed over time, especially focusing on advancements made in the last two centuries. This course analyzes how the U.S. has developed since 1945. Topics include the nation’s role as a global superpower, the Cold War (including Korea and Vietnam), and ongoing efforts to ensure equality for citizens. Designed specifically for students considering professorship, the class discusses daily aspects of teaching, including classroom management, lesson plans, and teaching complicated materials accessibly. This course examines the rise of nationalism, the Nazi Party, fascism, and Hitler. Students also read contemporary academic papers and personal accounts of the Holocaust. Students who earn a master’s degree in history online can pursue numerous careers, as graduates are trained to work efficiently in research, writing, analysis, and project management. Students may focus specifically on history through careers as professors, curators, or historians. Individuals may also use their online master’s degree in history to find jobs as political advisers, documentarians, or independent researchers. Historians spend their days analyzing documents and artifacts related to a certain time, person, place, or movement in history. After collecting research, they write about their findings. They may work independently, for museums, or with other history-focused organizations. Whether working at a community college, private four-year university, or public research institution, history professors help students learn about notable moments in history. Professors teach classes, assign projects, give tests, and provide feedback to students. They also complete independent research, publish articles, and present at academic conferences. Using their keen understanding of history, writers explore the nature of humanity, society, and revolutions. They may focus on fiction or nonfiction. Some authors write books independently, while others work for educational companies or other organizations.